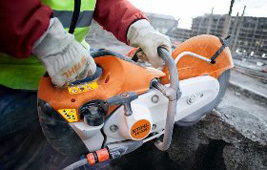 Robust machines for demanding tasks: STIHL Cut-off Saws are specially designed for hard work on construction sites. The equipment has particularly long maintenance and servicing intervals and uncompromising reliability. Operating costs are therefore kept to a minium and this plays an important part in increasing profitability. Other features include outstanding cutting performance, standard long life filter system. With the special STIHL accessories, such as the FW 20 cart, water tank or depth limiter, the powerful STIHL Cut-off Saws are optimally equipped for every job.